If you think about healthcare, it is a horizontal workflow that consists of an admission (hospital, clinic, doctor’s office), examination and treatment followed by discharge. It is a supply chain with many value added steps that are very complex and interrelated. There is a chain of custody of care and a requirement for complete care provenance. A perfect application for Blockchain and IoT. The healthcare industry is faced with unprecedented challenges due to its size and breadth. Healthcare spending grew 4.3% to $3.3 trillion in 2016, just under $10,000 per person and accounted for 17.9% of Gross Domestic Product (GDP). The consumer union estimates that one third of every healthcare dollar is wasted as shown in the graphic. As can be seen, regulation, waste and fraud three big components of those costs. It is estimated that 90% of the mistakes made in healthcare are administrative. Blockchain and IoT applications in Healthcare abound. Every application has the ability to address the areas of waste that have been identified along with the ability to significantly improve healthcare outcomes and streamline the process which in turn will reduce cost, improve utilization of very expensive assets and decrease care lead times. Group50 has created a Blockchain and IoT solution called Scioebc™ which is powered by Thinaer.io. Our solution provides the ability for healthcare providers to be able to track a patient from admissions to post discharge. Thinaer at Home™ connect patients at home with their healthcare providers extends the power of Blockchain and IoT through that critical 30 day post discharge period. Group50, subject matter supply chain and efficiency experts in the Healthcare Industry, has developed an integrated Blockchain and IoT plug and play solution called Scioebc™ . We have developed a 7-step implementation process that includes 4 workshops which are focused on guiding senior leadership through the planning and integration of these transformational technologies. 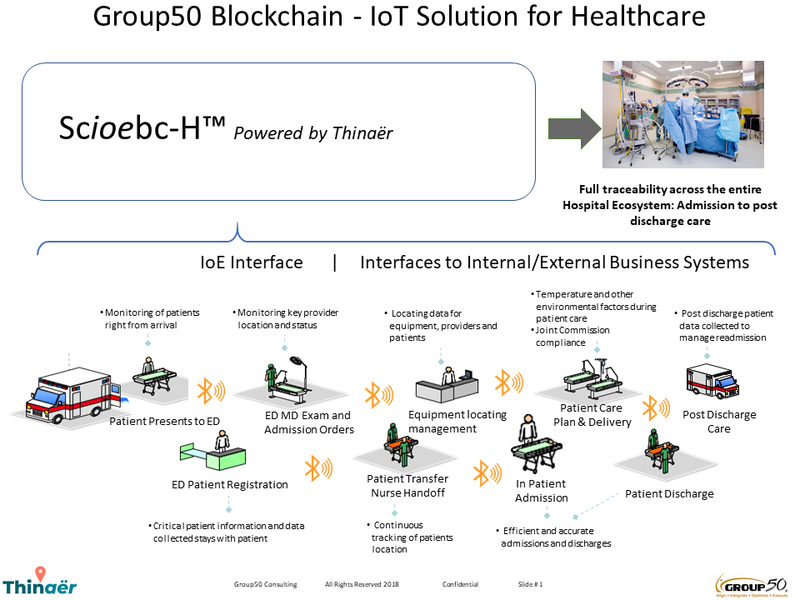 To find out more about how you can apply Blockchain and IoT to the Healthcare Industry, call Group50 at (909) 949-9083, drop us a line at Blockchain@group50.com or request more information here.